Tossing It Out Tossing It Out: Oh How I Miss You! 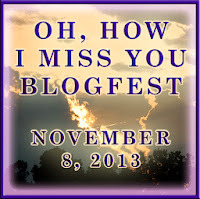 Of all the bloggers you read who would you miss most if they stopped posting? Or what about the blogs that have gone dormant with the bloggers silenced for who knows what reason? Who do you miss reading? Today is our day to tell about those bloggers inactive or still heartily chugging away who somehow touched us or made a dent in our world with their writing. The bloggers we really miss…and the ones we would really miss! On November 8, list one to three bloggers you really miss and one to three bloggers you would miss if they stopped blogging. Then go leave a comment on those blogs. My bad memory tends to obfuscate people and things that don't stay on my mind. If I don't seem to comment on your posts as much as I used to it's only because I'm trying my best to keep up with visiting those who have commented on my most recent post and I must apologize for not even doing so well at that. I am trying to do better. There are several blogs that I know that haven't been posting. It would take a bit of research to think of who they belong to since because they have been out of my sight they are in the deeper recesses of my mind. And I probably need to invest my mind in some other things besides trying to remember those blogs. One blog does stand out since it is frequently on my mind. The Saga of the Concrete Jungle was from a blogger whom I helped get started with his blog. He had a number of interesting posts and then left as he was going in a good direction with his subject matter. This blogger is hindered by the fact that he is a prison inmate who does not have internet access. His half-sister managed his blog for him using post material that she entered for him. In turn she would print out comments to send to him so he could respond. It was a slow process that fettered any effective social media interaction. His half-sister has since had a couple of kids and a job that keeps her too busy to manage the blog. Hopefully one day new arrangements can be made for this blogger. Last year I did a post that mentioned the commenters I'd miss. There are plenty more and if you are a regular commenter at Tossing It Out then you know who you are. I just want to say a big thanks to all of you for keeping me motivated. But as I mentioned in times past, I appreciate all commenters who stop by my site even if it's just once a year. The comments keep me posting. Don't think it's copping out for me to say I'd miss all of the bloggers I follow, but I would and I do. Sadly for me there are so many great blogs to visit and not enough time to see every post. Some of those blogs might be out of my mind at times, but I'd miss them if I went to visit and they were no longer there. It's very sad to visit a site only to see that the last post was months ago or more or even worse that the site is no longer even there. However, in the spirit of this blogging event, I will mention a few bloggers who deserve attention from more readers because of some of the excellent content they deliver. Good writing combined with topics that make me think more comes from Larry at DiscConnected, Andrew Leon at Strange Pegs and Stephen T. McCarthy at Ferret-Faced Fascist Friends. They often leave some good comments on my blog and I'd especially miss those. But let me reiterate--I'd miss all of you! Battle of the Bands Winner! My most recent contest was two versions of "Iron Man" (click link to compare the versions). First was the original by Black Sabbath and up against them was the mellow Cardigans version. It was not even close in the final tally. Even the votes for the Cardigans were half hearted as Black Sabbath easily swept the contest 20 to 3.
Who did I vote for? I always loved the Sabbath version, but now I'm more of a Cardigans guy. They did a rather daring and unique interpretation and it makes sense to me. Change that Cardigans to 4 votes and they still lose big time. Next Battle comes next Friday November 15th. What will I pick? Hmm. I think most of us have times when life makes it difficult to keep to our blogging schedule, but it sounds as if the Concrete Jungle blogger had remarkable difficulties to face. The writing/blogging community is incredibly supportive and encouraging...I'd miss everyone, too. Saga of the Concrete Jungle! I remember him. Wow, it has been a long time. Larry and Andrew will be pleased you named them. Larry leaves some great comments on my site whenever I start talking music. I had a hard time narrowing this down to a few favorite blogs as well! I'm more of a Cardigans person as well, but Iron Man? Really? Now I'm curious. Totally get where you're coming from, Lee. It is hard to keep up sometimes, and then there's life away from the computer too. The blog you miss sounds wonderful. Sometimes the process makes it all the more worthwhile. Something about the story you shared that imprints the word "hope" on my heart. Very interesting and inspiring. I think it already happened to me when Roger Ebert died. I know he was famous, but he was a blogger nonetheless, and one I read regularly. I recently came across one of his old posts, and I wanted to remark on it. It was an odd feeling, knowing he'd never see it. I know I'd miss a lot of bloggers if I stopped visiting or if they stopped posting. I guess that's one reason I continue even though my time is in a total crunch this year. I didn't even have time to hop on this hop this time around. Maybe next time. I think I remember reading the Concrete Jungle blog. I hope he is able to get back to blogging at some point. I couldn't choose people either really, there are too many I would miss. I'm amazed how attached I have become to so many bloggers in the years since I started. There are bloggers I miss. Some still blog, but I seem to miss a lot of their posts. But, I don't seem to have as much time to be here as I did a few years ago. Saga of the concrete jungle blogger really had a hard time. Even I am struggling to find time to blog. Hope I can strike a balance between writing, work and blogging. Interesting story about the blogger you miss. He must have really wanted the interaction to go through all that. Love the Ironman theme and I'm not surprised which version won. I think I've been to The Saga of the Concrete Jungle a few times, but it's been a long time. Probably even years. Thanks for the nod, Lee-I'd miss your blogs as well. I miss Stephen T. McCarthy's "Stuffs" blog-even though he sometimes 'cheats' and puts what would have been a "Stuffs" post on FFFF. I would miss your blog Lee. You were an earlier follower on my blog and evened up my numbers. So many blogs, so little time. I'm still discovering new blogs and can barely keep up with the current ones I already follow. I'd most miss the bloggers with whom I'm developing an online relationship. Like you, Lee. I'd be hard pressed to name just three, although I know Elizabeth S. Craig would be one of them. And Alex. They both visit every single time and are just the nicest people. I bet the Concrete Jungle was a fascinating blog! Thanks to all for the comments so far. I've got kind of a busy day today so I'm not going to respond individually for now, but there's not that much to say either other than I'd miss every one of you if you weren't out there. Naming a few is a token blogfest gesture. I concur, it is very hard to keep up with all the bloggers but I too would miss them all. I agree, way to many great blogs out there and while picking for my list was really difficult, I am enjoying reading and discovering new blogs as I hop around. It's kinda like choosing your favorite chocolate. How hard would that be? I just visited the Saga of the Concrete Jungle. He's a talented poet. It's a shame he wasn't able to continue. I imagine blogging could be an incredible outlet for prisoners. I really appreciate your taking the time to visit my blog whenever you do, Arlee. That one would be really difficult for me. Lousy memory. I'd come up with something like, "I miss that woman who had the yellow flowers on her background and used to do the funny blog about her two dogs"...or something like that. I can tell you who I'd miss...you. what an interesting topic-- funny though is that I don't realize people have disappeared until I go through my really old posts and see the comments. Then I wonder what happened to all these people who I used to connect with so freely and now they seem to have disappeared. I have noticed on my Blogger reader that some of the blogs I followed in the past have been taken over by strange spamming types of sites. I think it happened when one closes down a blog and their URL is up for grabs, especially if there were a lot of followers. Robyn -- Internet in prisons has been a problem with some of the scammers yet could be so useful for those trying to further their educations, do online research, or to use as a creative outlet as in blogging. I know there's an answer, but maybe those in charge are afraid of what could happen from it. LD -- You nailed my main problem--remembering. Not just the ones who are gone but the ones who still blog. If they don't leave a comment on my site I tend to forget them. Not actually forget them, but more accurately neglect them due to my own time constraints. Karen -- It is interesting to look at the old comment sections to see who are still commenting and who quit long ago. Your article about the spammers was very interesting. Hey, thanks so much for the shout-out, my friend. I sincerely appreciate that! One blog that I DO MISS (because the blogger abandoned it a year ago) is GYPSY IN MY SOUL. She used to post some very entertaining blog bits, and then she just disappeared without a word. I know she was working on a genuine writing career, and so I hope that her blog silence is simply a sign that the career started to really take off and she had no more time for bloggin'. Lee, I'd obviously miss more than one blog if you ever quit (certainly I'd miss this one as well as 'A Faraway View' - your dream blog). I'd also certainly miss LC's 'Back In The USSR' - we need more political blogs like that one. I'd be very sorry to see my friend FAE discontinue her 'Far Away Series'; and another blog I've come to enjoy reading more and more in recent months is Robin's 'Your Daily Dose'. But every blog I 'Follow', I do so because I like a lot of what gets posted there, so just as you said, I really would miss every one of them if they suddenly went 'bye-'bye. Thanks again for mentioning me, McBuddy! Its so cool getting to know these great blogs! The prison one is fascinating. I wish he'd start blogging again, too. Wow. I've done this Blogfest in the past. It's kind of fun, but recently I've taken the cure and tried to swear off Blogfests. It's tough though and your tempting me. I have to say that I agree with you about Larry and Stephen - I wish they would get more traffic. both post some really interesting, thought provoking stuff and then there's the goofy stuff that's just plain fun. Not to mention their BOTB posts twice a month. I know you've missed me the past few posts, but I'm up and running now, so watch out! Wow! Thanks, Lee! I appreciate that thought. Who I'd miss is kind of a rotating thing. Bloggers rotate in and out of the game. There is one I miss because she abandoned the blog life but we're Facebook friends still. Another has serious health problems that by her last post I fear have gone critical. I Have tried to get in touch by e-mail, but no response. Friends come and go. A precious few we hang on to; more we try to hang onto but they just go quiet. Blogging's the same way. You get attached only to lose them. But new ones come around, like you, Larry, and STM, and as long as that happens the whole thing is still worthwhile. I remember Concrete Jungle from the 2011 A to Z. He is very talented. I had a hard time narrowing my list this year, so I didn't participate, Thanks for everything Lee! Yeah, this blogfest was tough. I only listed people who stopped blogging or really slowed down. The truth is I heartily enjoy all of the blogs I follow. I would miss any of them that decided to pack it in. I hate losing bloggers that I've loved. So long as they're happy though I have to say I guess it doesn't matter that they've left. Such a pity that Saga blog didn't keep going. I hope that guy does find some other way of communicating in future. It's amazing to hear from people on the inside, something a lot of us know nothing about. I had a hard time with this one. I've stopped following a lot of the blogs I used to comment on. Many don't blog at the same time when I do, which means I miss their posts in my dashboard. I miss commenting and connecting with these old friends, but my blogging time greatly reduced compared to what it used to be. Thanks again to all for stopping by for this post and especially for leaving your comments. Nice reminder to remember our blogging buddies. In the personal finance space, Financially Consumed, Money Cone, and Watson Inc were some of my favorites. I think life happened and they no longer had time to maintain their sites. Hope they're all doing well. I actually had Tossing It Out withdrawals when you went driving cross country. Keep it up Lee! It is disturbing when someone just stops blogging. If you know them other ways, you know they are just using facebook more, or they didn't feel like doing it anymore. But how about older bloggers. Did they die? here's one: http://www.cominghometomyself.blogspot.com/ she's still writing, thank goodness. I love her stories.. most of them true. Maybe all of them. Including, her adventures as a nun!